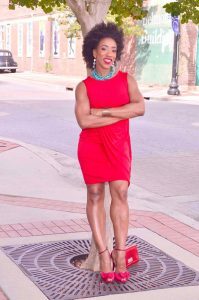 Laticia “Action” Jackson has been called one of the most dynamic and energetic personalities in the health promotion, body awareness, women’s health, fitness and personal development field. With an academic background that includes a Master’s Degree in Public Health (M.P.H), B.S. Degree in Exercise Physiology, Certified Corporate Wellness Coach, Certified Master Level Personal Trainer, Certified Weight Loss Counselor and Certified Lifestyle and Weight Management Specialists, Laticia has the proven knowledge, skills and ability to motivate, inspire and cultivate change in the lives of many. She’s received both national and international recognition by being featured as a top-level athlete and writer for over 16 national and international health and wellness publications (Oxygen, Muscle and Fitness Hers, Active USA, and more). She’s been the go-to fitness expert for TV shows such as C.W. 31 Good Day Sacramento, Blab TV, Council on Aging , WEAR 3 Channel 3, Fitness Friday’s before the Steve Harvey in the Morning Show, Hill in the Morning Show and many more. She’s a 2008 Fitness Olympian and 3-Time National Physique Committee Fitness Champion. Laticia’s amazing ability to connect with her audience and tell her story of overcoming domestic violence and her refusal to become a victim, has led to numerous invitations to speak at annual women’s empowerment events such as The Emmett Tills Legacy Foundation’s Loving from the Inside Out Women’s Symposium, Favor House White Rose Luncheon, E3 Women’s Empowerment Conference, Alpha Kappa Alpha’s Paint the City Pink Breast Cancer Event, The Powerful Women of The Gulf Coast Pursue Your Passion Business Conference and additional speaking events that provide women with the tools to enhance and transform their professional and personal life. Laticia’s the author five books, with her most recognized book being, I’m Not a Size Zero. I’m Not A Size Zero is a women’s fitness and wellness training book that focuses on the impact the media has on women and their body image, and teaches women the most important size they can become is a size healthy! Her successful workshop, “Love Your Body, Love Yourself”, was built on the same principles as I’m Not a Size Zero, and has been sponsored and supported by West Florida Hospital (Ranked Top 100 Hospital in 2015) with rave reviews and consistent positive feedback from attendees with televised event coverage on multiple networks. Laticia is the creator and owner of Wellness and The Working Woman™. Wellness and The Working Woman offers wellness solutions for today’s working woman who desires the tools to put herself and her health at the center of her career. Laticia is often called upon from national population health organizations such as The American Heart Association, The American Diabetes Association and The American Cancer Society to use her expertise for nationwide health promotion and health awareness events that address chronic preventable illnesses such as heart disease, stroke and diabetes. Laticia is a proud Veteran of the United States Air Force, member of Delta Sigma Theta Sorority, Inc., and a survivor of domestic violence who has become an advocate speaking at events to bring awareness and a positive voice to an often stigmatized topic.